Featuring the amazing Derek Evilsizor as Frank Sinatra. You want to be there for this spectacular performance! Tickets to this show make the Ultimate Valentines Date! Enjoy a fabulous evening complete with an Italian Dinner while helping fund more life changing surgeries! A HUGE THANKS to all in attendance for our 3rd Annual Sinatra Night. Everyone enjoyed a wonderful evening of entertainment. A Special THANKS to everyone who came out for our Paint, Brews, & Smiles Event! 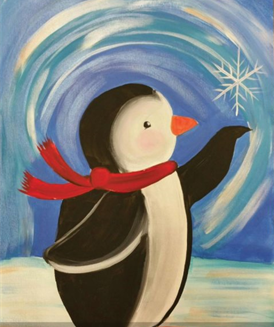 Our spectacular artist, Jamie Bell did a fabulous job leading all through a wintery masterpiece. We had over 50 people in attendance and can now provide even more life changing surgeries! A shout out to Great Divide for providing the great venue & brews…. Chik Fil A for the tasty food… King Soopers for the snacks… and Styria II Bakery for the delicious breads! 3rd Annual Tribute to Frank Sinatra LIVE!!! Don’t miss A Tribute to Frank Sinatra LIVE at Ciancio’s at Hyland Hills Golf Course Saturday February 16, 2019 5:30pm-9:30pm. Featuring the amazing Derek Evilsizor as Frank Sinatra. You want to be there for this spectacular performance! Tickets to this show make the Ultimate Valentines Date or Holiday Present!!!! Visit our Facebook events page for tickets Purchase Tickets Here! or call us at 303-707-1361. Enjoy a fabulous evening complete with an Italian Dinner while helping fund more life changing surgeries! Our 20th Annual Gala Was a Spectacular Event! We are thrilled to announce we raised over $53, 000 at our 20th Annual Gala! A special thanks to all of our Mother of Cleft Speakers, Sister Jennifer Gordon from SCL, Emcee Frank DeAngelis, and Live Auctioneer Vic Lombardi! Uplift Internationale is grateful for all of our incredible supporters, we raised a great amount of funds to continue in succeeding in our mission of Mending Faces… one child at a time! Our 2017 Gala Was a Tremendous Success! Together we raised over $70,000!! !